IONIC Edge racers Seth Johnson, Nick Ksobiech and Brain VanCleve Jr at Eau Claire, Wis.
EAU CLAIRE, Wis. – Three IONIC Edge Chassis racers competed this past weekend at the Briggs & Stratton LO206 Cup at Midwest Karting Association (MKA) in Eau, Claire, Wis., where Seth Johnson, Nick Ksobiech and Brian VanCleve Jr. entered their Kyle Luttrell Racing-built and supported karts and raced to top finishes over the two-day event. The race marked the third and fourth rounds of the series, which attracts the best 4-cycle sprint racers and teams throughout the Midwest. Nick Ksobiech won the Animal Sportsman final in both days of competition! Nick also collected a couple heat race wins throughout the weekend. Seth Johnson, one of Luttrell Racing’s original customers, won the both heat races and the Animal Junior main event on Saturday and returned Sunday to win one of the two heats and finish second in the final. Brian VanCleve, who’s been on a hot streak in the WKA Gold Cup Series as of late, finished sixth in the LO206 Junior final, a month after finishing a competitive second in the 12-lap LO206 Junior final and second place overall at round one of the 206 Cup at Dousman. In Kentucky, IONIC Edge racer Matt Skaggs was racing in the inaugural South Eastern Karting Alliance (SEKA) event at the NCM Motorsports Park kart track in Bowling Green. Skaggs, the 2014 WKA Gold Cup LO206 Heavy national champion, drove his Ionic Edge to the win in LO206! 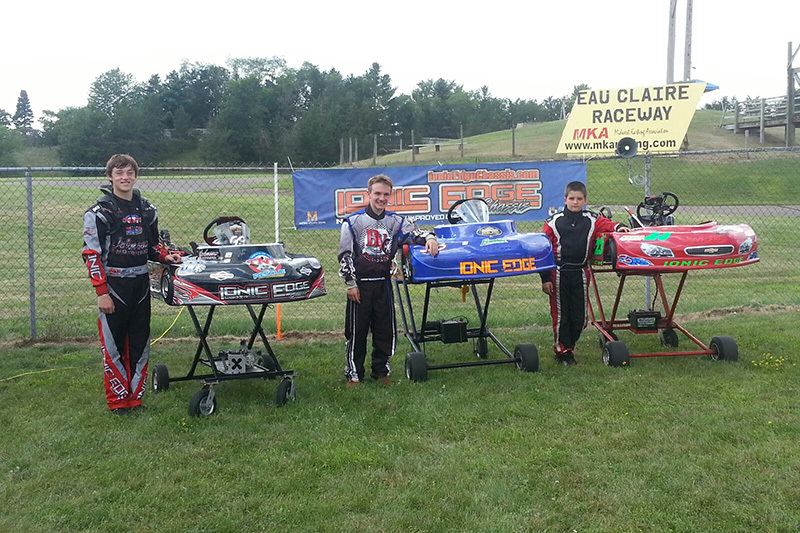 The IONIC Edge Chassis racing team will be in full effect at the Commercial Point Karting Classic, Ohio, August 7-9, where three team drivers will compete in the most prestigious street race in Central Ohio. Matt Skaggs will be returning to Commercial Point for the first time since 2012 when he came from 27th to 2nd behind race winner Eric Fagan, who recently joining the IONIC Edge race team. Ohio native and last month’s LO206 WKA winner, Dustin Demattia, won’t have to travel far to field his IONIC Edge Chassis. Fagan, a multi-time national champion and Commercial Point winner, will complete the trio. The team plans on racing in the Clone Senior and LO206 Senior classes aiming for a1, 2, 3 sweep in both classes. If you’re interested in learning more about Ionic Edge Chassis, contact Kyle Luttrell at 404-516-8934, email kyle@luttrellracing.com and visit the team’s website at IonicEdgeChassis.com.